FC Barcelona sealed their place in the Copa del Rey final for the fourth season running after an event-filled, 1-1 draw against Atlético Madrid at the Camp Nou, adding to last week’s 2-1 win at the Vicente Calderón (3-2 aggregate). After a relatively calm first half, the second period brought a whirlwind of emotions with three red cards, a penalty miss, and a late Atlético equaliser which set up a nail-biting finish to the tie. The omens were strongly in Barça’s favour, with Atlético failing to win in their previous 16 games at the Camp Nou, but Los Colchoneros knew they had to go for broke, with a 2-1 deficit needing to be overturned, which led to an enthralling cup match. The visitors started the brighter of the two, but the first effort on goal came from Barça on four minutes when a punt up field from Cillessen found Arda, who then fed in Luis Suárez, who struck at the near post. The resulting corner was cleared, and Atlético had a three-on-two situation on the counter. Carrasco cut inside onto his stronger right foot and aimed for the corner, but Cillessen was equal to it with a good stop. Atlético continued to be the more threatening side overall, however, as a long-range shot from Koke tested the keeper’s gloves before Savic’s header on target was denied just after. It took Barça until the 27th minute to get their first shot on target, as Messi tested Moyà’s reflexes, though it was a routine stop for the Spanish keeper. Atlético arguably enjoyed the better chances, but with Messi and Suárez around, Barça rarely need a second invitation. A nice drop of the shoulder from André Gomes to take on Torres on the halfway line was followed by a neat pass to Suárez, who touched the ball off to Messi and, from then on, the alarm bells were ringing for the Rojiblancos. The Argentine shimmied through a handful of defenders before striking low from outside the box. The shot was too hot for Moyà to handle and Suárez was naturally on hand to pick up the pieces and give Barça a 1-0 lead (3-1 agg), just before half-time. With Atlético’s chances narrowing by the minute, the visitors began to push further forward in an attempt to revive their faint hopes. 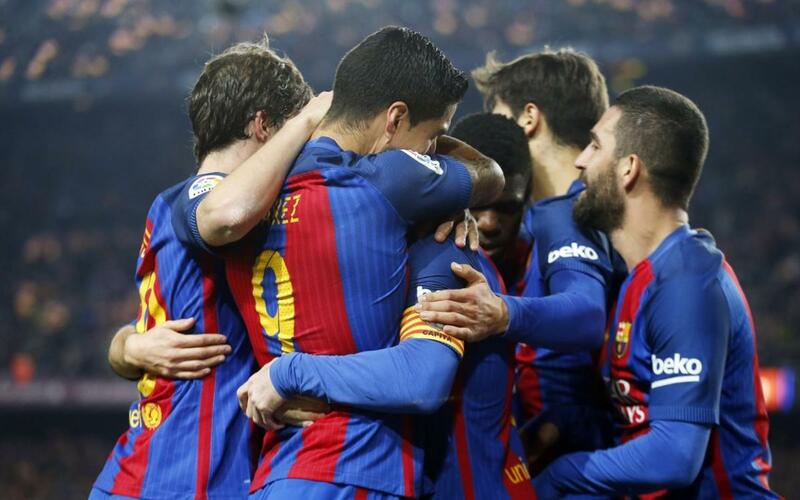 Their hopes were boosted on 57 minutes when Sergi Roberto was shown a second yellow card for a high challenge. Within seconds, Atlético had the ball in the net through Griezmann’s powerful finish, but the goal was ruled out for offside. Replays showed that the Frenchman was, in fact, level with the last man, as Barça were let off the hook. The man disadvantage was taking its toll, though, as Atlético looked ever likelier to get back into the tie, with most of the second half being played in Barça’s half. Along with the 67th minute came a crucial passage of play, as FilipeLuis sent in a wicked cross towards Griezmann, only for Piqué to masterfully intervene. From the resulting corner, with Arda set to clear, Carrasco mistimed his tackle and was given a second yellow, bringing the game back to 10 v 10. Barça sparsely ventured into the opposition’s territory, but when they did, they threatened. On 76 minutes, Messi’s thunderbolt of a free-kick crashed against the crossbar, and the drama was only getting started. With ten minutes left of normal time, Atlético were given a golden chance to halve the deficit from the spot, as Piqué was judged to have clipped Gameiro from behind. The same player got up to take the penalty, but the striker blasted the ball over the bar. Most Barça fans thought that would be game over, but there were still plenty more trials and tribulations to come. Such was the nature of the second half; nothing could be taken as a given, even though the clock and the scoreboard were in Barça’s favour. Two minutes later, Griezmann was played through on goal and, with a delightful disguised pass, laid the ball on a plate for Gameiro, who atoned for his penalty miss minutes earlier to set up a grandstand finish (1-1, 3-2 agg). Two minutes after that, a Messi-led counter-attack ended with Suárez blasting the ball into the net, but it was correctly flagged offside. Atlético threw everything forward in pursuit of the goal that would take the tie to extra-time with a siege of crosses into the box, as Barça’s resolve was put to the test. A Koke cross in the final minute that fizzed between keeper and defence had Barça hearts racing but, thankfully, there was no Colchonero to attack the stray ball. The referee was certainly not out to make friends in Barcelona, as he sent off Luis Suárez in the final minutes, before awarding five minutes of added time. Atlético’s siege continued deep into the final seconds, with the ball being cannoned into the Barça box with no remorse, but the defiant backline held its nerve as the Catalans grinded their way into yet another cup final.